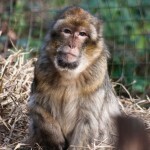 Chico is an energetic and ambitious Barbary macaque monkey who was confiscated as a youngster from a pet owner in Paris. He came, along with his group-mates Mario and Donkey, to live at The Monkey Sanctuary in 2008. Chico sometimes has a hard time accepting the role of “second-in-command” in his small social group – he wants to be the boss! Donkey is a shy Barbary macaque monkey who came to live at the Monkey Sanctuary with Chico and Mario. 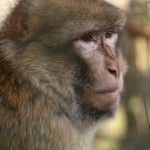 He is the oldest of the three macaques, all of whom have reached adulthood during their time in Cornwall. Suspicious by nature, Donkey does not trust humans easily, his long-term carers have managed to gain his trust, and he enjoys spending a bit of quiet time near his preferred humans when he can. 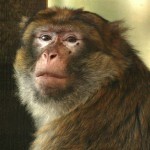 Mario is a dignified male Barbary macaque monkey, and the leader of his small group. He was most likely born in the wild in North Africa, and incredibly, the first thing we know for sure about him is that he was found as a youngster, in Paris, tied to a lamppost! Mario is a skilled leader. Mario is quite reserved with his human carers, and seems to most enjoy sitting atop a high perch in his territory and surveying the world around him.